-pation. After all, nothing says Happy Holidays like a chain-smoking transvestite in faux leather. So today is wrapping up things at work, getting some last minute items taken care of for the business, and possibly, the enjoyment of a frosty alcoholic beverage. Christmas day is driving, driving, eating, driving, eating, driving... with Aria picking up more loot at each stop. So hopefully I'll be back in the swing of things by Friday. In the meantime, I leave you with a video demonstration for Chocolate Espresso Truffle Pie. Whatever you're celebrating this season, I wish you good times, safe travels, and excellent company! Anyone who can fit in a quote from Rocky Horror 2 days before Christmas is someone whose blog I want to read! 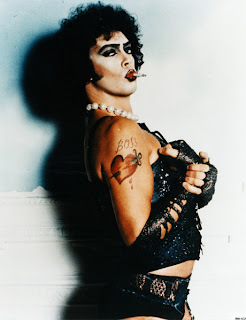 ;) (Oh, and I'm still swooning over that pic of Frank N Furter. . . such memories!). Fabulous recipes, fabulous blog--so glad I stumbled on it! I've added you to my Google Reader--now off to explore the archives. Happy Holidays! That Kahlua cheesecake looks awesome!